Defence Research and Development Organisation (DRDO) is an agency of the Republic of India, charged with the military's research and development, headquartered in New Delhi, India. It was formed in 1958 by the merger of the Technical Development Establishment and the Directorate of Technical Development and Production with the Defence Science Organisation. It is under the administrative control of the Ministry of Defence, Government of India. 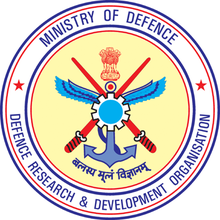 Defence Research and Development Organisation (DRDO) was established in 1958 by amalgamating the Defence Science Organisation and some of the technical development establishments. A separate Department of Defence Research and Development was formed in 1980 which later on administered DRDO and its 50 laboratories/establishments. Most of the time the Defence Research Development Organisation was treated as if it was a vendor and the Army Headquarters or the Air Headquarters were the customers. Because the Army and the Air Force themselves did not have any design or construction responsibility, they tended to treat the designer or Indian industry at par with their corresponding designer in the world market. If they could get a MiG-21 from the world market, they wanted a MiG-21 from DRDO. DRDO started its first major project in surface-to-air missiles (SAM) known as Project Indigo in 1960s. Indigo was discontinued in later years without achieving full success. Project Indigo led to Project Devil, along with Project Valiant, to develop short-range SAM and ICBM in the 1970s. Project Devil itself led to the later development of the Prithvi missile under the Integrated Guided Missile Development Programme (IGMDP) in the 1980s. IGMDP was an Indian Ministry of Defence programme between the early 1980s and 2007 for the development of a comprehensive range of missiles, including the Agni missile, Prithvi ballistic missile, Akash missile, Trishul missile and Nag Missile. In 2010, then defence minister A K Antony ordered the restructuring of the Defence Research and Development Organisation (DRDO) to give 'a major boost to defence research in the country and to ensure effective participation of the private sector in defence technology'. The key measures to make DRDO effective in its functioning include the establishment of a Defence Technology Commission with the defence minister as its chairman. The programmes which were largely managed by DRDO have seen considerable success with many of the systems seeing rapid deployment as well as yielding significant technological benefits. DRDO has achieved many successes since its establishment in developing other major systems and critical technologies such as aircraft avionics, UAVs, small arms, artillery systems, EW Systems, tanks and armoured vehicles, sonar systems, command and control systems and missile systems.